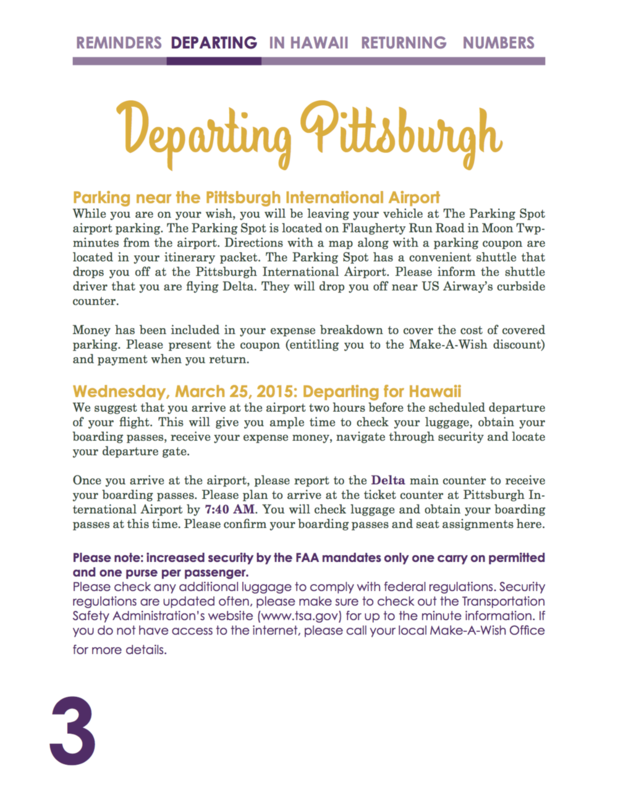 While working with the Make-A-Wish Foundation of Greater Pennsylvania & West Virginia office, I was tasked with creating a more effective itinerary for wish trips to Hawaii. We decided that the design had to be intuitive, organized, and adaptable. To meet those goals, I drafted a design that uses simple color principles and type hierarchy to create a structured but beautiful document. The custom color scheme, matched to the cover page, works in concert with the hibiscus flower cutouts to carry a Hawaiian theme through the design. Images were also carefully selected to be gender neutral yet indicative of the natural beauty of the Hawaiian islands. Most important to the design, however, was that it be adaptable. 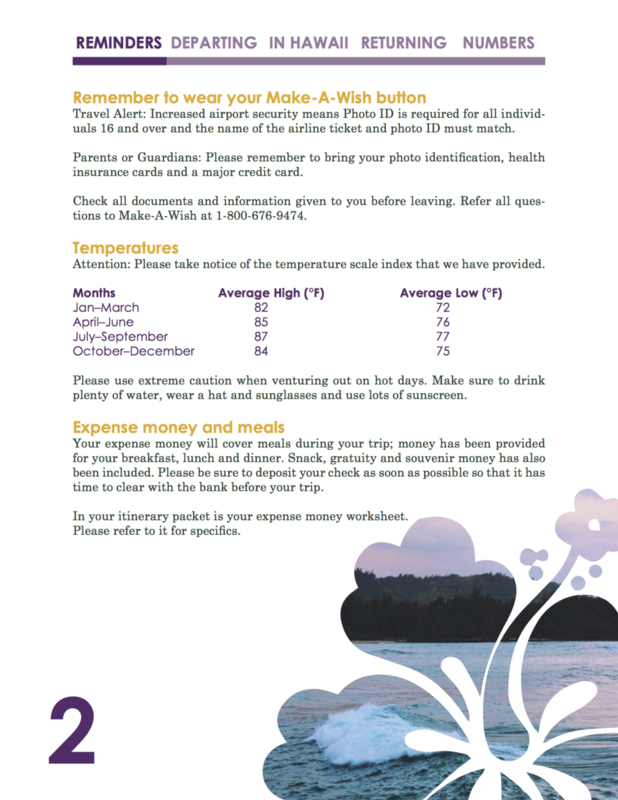 Not everyone at each Make-A-Wish office will have access to professional layout software to modify the content, so a solution was needed. That's why the entire design was recreated in Microsoft Word format. Stretching the capabilities of Word as a design tool to their absolute limit, the document adapts to its user so it can easily be edited by any staff member. 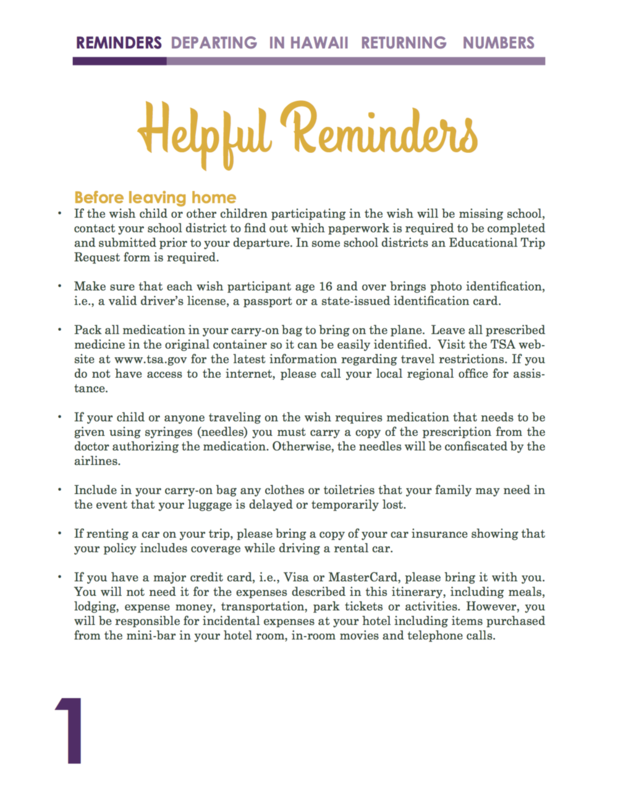 The end result is a functional document that is easy for families to read while being playful and colorful enough to ensure both parents and wish children alike are excited for their Hawaiian adventure.